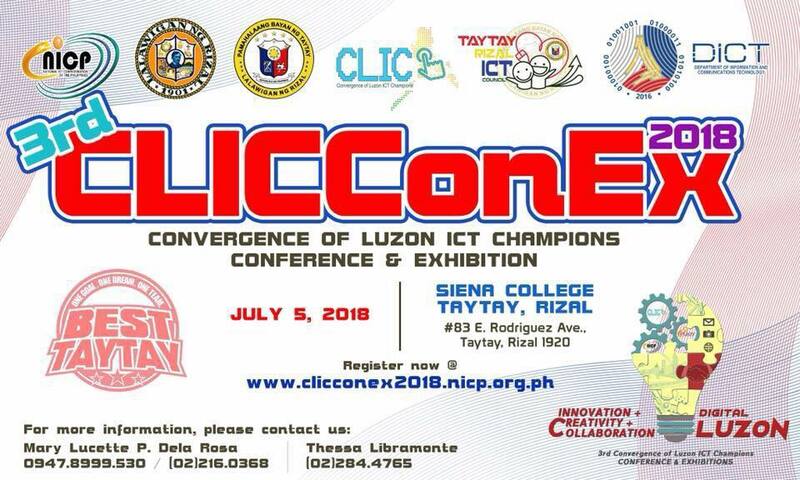 The Convergence of Luzon Information and Communications Technology (ICT) Champions Conference and Exhibitions (CLICCONEX), the official Luzon cluster of the National ICT Confederation of the Philippines (NICP) will have its third national conference on July 5, 2018, at Sienna College in Taytay, Province of Rizal. This year’s host is the Taytay Rizal ICT Council (TRIC) and the Municipal government of Taytay headed by Taytay Mayor Joric Gacula with Convention Chair Lucette De La Rosa. The theme of this conference is “Innovation + Collaboration + Creativity = Digital Luzon”, Making Academe-Government-Industry Collaboration (MAGIC) that form the base of the aims and goals of all ICT Councils around the nation under NICP. NICP is a national organization of now about eighty information and communications technology (ICT) councils all over the Philippines, representing the stakeholders in their respective geographical locations such as regions, provinces, cities, and municipalities with the vision to be the recognized and unifying advocate for countryside ICT development. To strengthen the capacity of ICT councils to develop strategies for generating jobs and investments, NICP created clusters for its three major geographical divisions, namely Luzon, Visayas and Mindanao in 2012. NICP holds its National ICT Summit during the last quarter of the year with ICT cluster conferences held in the Visayas in the first quarter, Luzon in the second quarter and Mindanao in the third quarter. With the support of the Department of Information and Communications Technology (DICT), CLICCONEX aims sustain the working synergy for all Luzon ICT Councils and other ICT councils of NICP, strengthen the collaboration between the ICT Councils and their respective DICT field operation officers (FOOs) in Luzon, share programs and best practices among the Luzon ICT Councils and identify resources and support for ICT development among Luzon ICT stakeholders and partnerships with the private and public sector. This year the CLICCONEX panels will focus on four themes, namely, Accelerate PH, Digital Skills, and Scale Talent Development, Reshaping Provinces through Digital Transformation, and Digital Cities Caravan: Transforming Cities Thru Best Practices in eGovernance. Digital Cities Caravan: Transforming Cities Thru Best Practices in eGovernance Panel aims to showcase the winning initiatives of LGUs in Luzon which has integrated information and communications technology (ICT) for the effective and efficient delivery of public services, more active citizens engagement and adoption of new technologies.